One man's trash is another man or woman's…wader changing mat. The ultimate recycled product, the Remat is a byproduct from automobile gasket manufac turing (o-rings), reworked and repurposed for a long life of heavy-duty use. Beyond wader changing, it doubles (or triples) as a driftboat seat cushion, work station floor mat or boat floor protection from studded boots. The tough, cushy, water- and stain-resistant Remat is also showing up in front of kitchen sinks and mudroom doors wherever anglers live. 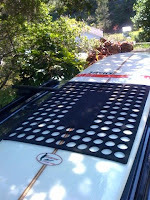 Surfers, skiers and snowboarders have found the Remat to be ideal for parking lot changing as well as for cushioning between surfboards on the rack. It's a good thing to have around camp too. Made from 100% synthetic nitrile rubber. Acrylonitrile-Butadiene Rubber (NBR) with 30% – 35% Acrylonitrile Content. Commonly referred as "Nitrile" or "Buna-N" rubber. The ReMat is one of those new creature comforts that I'm finding it difficult to live without. It's the last thing I throw in the Guidewater Duffle with the GW Waders and RiverWalker Boots--and the first thing I pull out when I get to the river. Keeps the sand off your socks. I also use it underfoot in the bow of a canoe or boat when I'm wearing studded wading shoes--keeps the studs from marring the boat. Very much appreciated by owners of boats. If I get a fishin' camp someday, the ReMat will welcome those at the front door. Outstanding, indeed. Sure beats my beat up old towel. Gotta get one! Big fan of Remat! 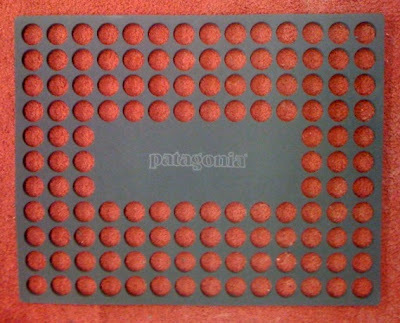 The most versatile and (surprisingly) most functional Patagonia product I have ever owned. Inspiring, original and nothing else like it! I use it practically everyday – in more ways than one. Remat rips! I've had lots of clients change on that sucker already. More people and companies need to be looking at cool, creative, functional ways to recycle old wast into something usable. Nice work Steve. Thanks for the Remat comments everyone. I'm particularly fond of this product as most of my colleagues will tell you. It's kind of a running joke around the office. I'm glad to hear that this product is "inspiring" and "versatile". Graham, I'll make sure that the buyers know that there is at least one of you in the UK that would like to see this product in the international line (which tends to be a subset of the domestic line). Keep making your voices heard here on Way Upstream. This is a joke, yes? $35? And you could tie a couple of thousand Chernobyl Ants with it too! They're actually hard to find right now, no joke. Joke or no joke, I want want too!